Many of our customers order from our website, and many of you order our "Posie Shoppe Exclusives". Thank you for that! We try to make sure that the arrangements we design and put on the website will reflect the style that you are looking for. But, not all of our custom designs can be placed on the website... maybe they are too specialized, they are designed too late in the season, or some other reason. With that in mind, we thought you might enjoy seeing some of the custom designs that we did this past Christmas season! This design features amaryllis, cymbidium orchids, calla lillies, hybrid lillies, roses and carnations in a fiberglass bowl. Custom designed for one of our favorite cusomers. This design features green spider mums, roses and bells of ireland mixed with copper, gold and brown permanent items. "Merry Christmas" is spelled out in gold on an aspidistra leaf. 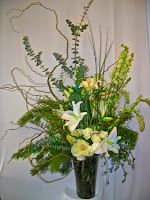 Designed for the annual Hospice Auction fundraiser, where we donate "A year of flowers" to the auction. This design features red roses and white dendrobium orchids arranged pave style with white bleached branches and permanent red berries. 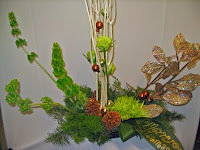 This was created for our annual holiday open house as one of the arrangements given away to our customers. This centerpiece features spray roses, button chrysanthemums, silver sprayed beargrass and christmas ornaments. It was designed for a customer who loves the whimsical and unusual. This elegant vased arrangement features oriental lilies, roses, ornamental kale, tuberose, stock and larkspur. It stood approximately 3 feet tall and was designed as a sympathy arrangement. Feel free to call us with your unusual requests. We love to create custom designs! Welcome to the Posie Shoppe blog! We are so excited to share our new blog with you! Please be sure to let us know if there's anything you'd really like to see here. Because we know, it's not ALWAYS all about us. In fact, it's usually about you. As you know, you can also find more information on our retail website.